As of Monday 8th, Tesla shares (NASDAQ: TLSA) have soared by 6% despite the production setbacks Tesla have had regarding the Model 3. Although there was a decline due to the production setbacks, Tesla shares are now sitting at $336.29 per share as of 12:34 p.m. EST. Experts say this is more than likely due to the high level of optimism surrounding the company’s Q4 earnings, and the positive reviews the Model 3 is receiving. In addition, Tesla exceeded its forecasted 100,000 total deliveries for 2017 by 1,312 units. This is a 33% increase over the previous year. And Elon Musk ensures us that the ‘manufacturing hell’ surrounding the Model 3 is coming to a close. Because of these factors and the pace at which Tesla is producing and delivering vehicles, investors are expecting better than expected figures when Q4’s earnings report is released later next month. 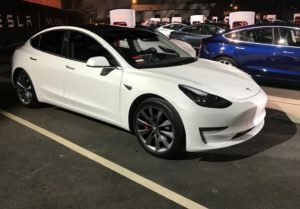 And with the Model 3 gaining positive reviews despite its slow rate of production, investors are looking at it in a positive light despite the bad news they have had recently.